Y’all I have a great table centerpiece for Christmas that I am going to show you today. You will love the rustic burlap accents in this one! This post is sponsored by At Home however all projects and opinions are my own. If you missed my rustic deer Christmas place setting, you may not have seen me post about At Home Christmas Decor. Don’t worry, however, I will fill you in below! Plus you can buy everything you need for this table centerpiece at a store near you. 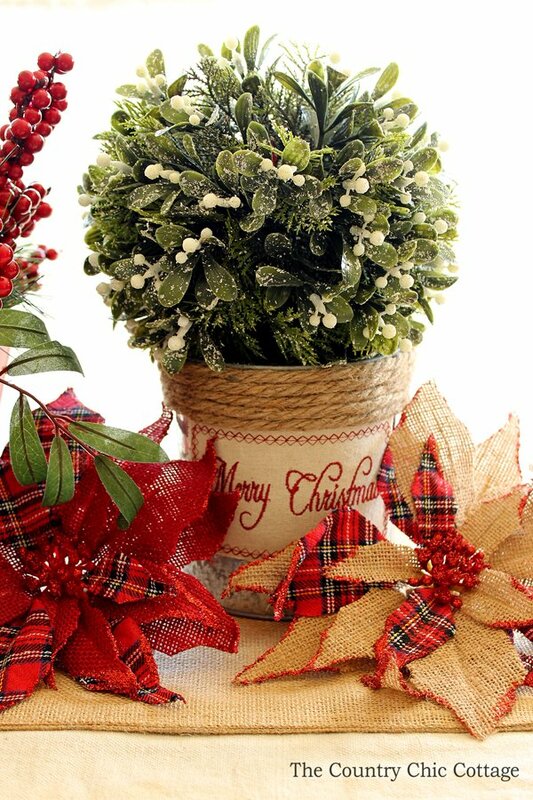 At Home has a wide selection and everyday low prices on Christmas decor and so much more for your home. Literally everything you see in the picture below was picked up at my local store. At Home has their Christmas decor broken into various decorative themes. Most everything I picked up is from the Holiday Hoedown collection but you can mix and match from all of the collections to get the items you love most for your home. At Home also offers 101 Varieties of Christmas Trees. The At Home tree lot covers an acre of fun with over 100 trees. At Home has a large in-store tree selection to touch and feel. Each tree is curated because of a unique feature and every tree in the store (with the exception of 1) is exclusive to At Home! They just might have the Tree for Me. 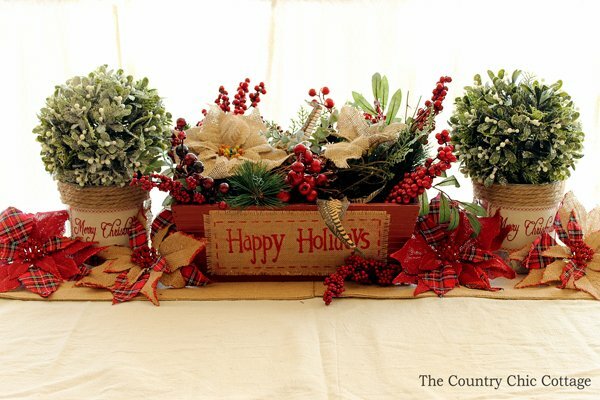 I started with the wood basket in the center to inspire my table centerpiece. It already had that burlap on the front with the “Happy Holidays” sentiment. 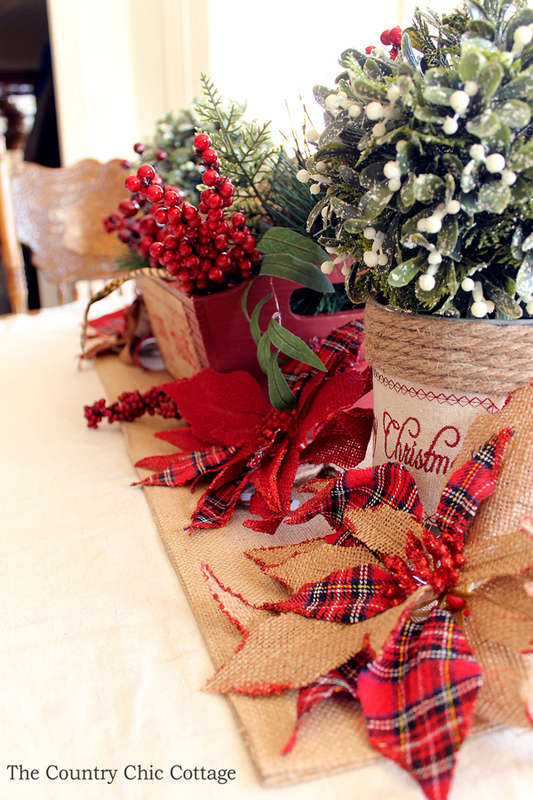 I decided right then and there to go with a rustic burlap table centerpiece for Christmas. I filled the wood box with a floral spray that was in the At Home store. It had those gorgeous burlap poinsettias already on it and I fell in love. It fit perfectly inside of the box. I added a box of those artificial red berries to my cart as well. I tucked them in around the flowers to create a gorgeous centerpiece. I just couldn’t stop there. After all there is just so much eye candy in At Home that I just had to add a few more pieces to my table. 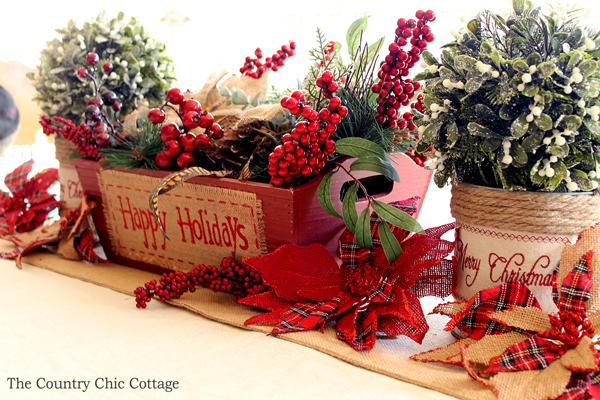 Those amazing plaid and burlap poinsettias can be purchased individually and I filled my cart. They have a clip on the back so you can put them on your tree as well. The galvanized buckets that I used on both ends are actually a set of three nested containers. That just means I have plenty to use in other areas of my home! I loved the rope wrap and the “Merry Christmas” on the front. The mistletoe balls were in the Christmas floral section and it was love at first sight y’all. I thought they looked perfect in the buckets. I repeated the same bucket and mistletoe ball on the other end and filled in with more of those amazing poinsettias. 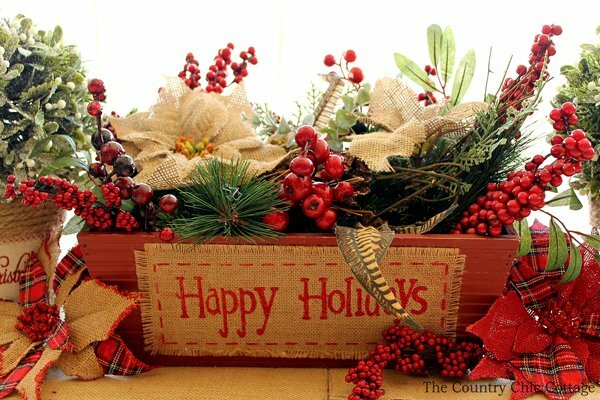 Stop and see the At Home Christmas Decor at a store near you. While you are there, shop for every room in your home with furniture, rugs, decor, and oh so much more! This may very well be my new favorite store. 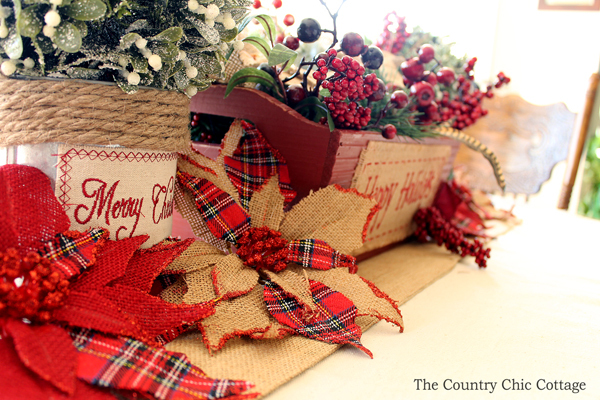 Will you be looking for some rustic Christmas decor at your local At Home store? Beautiful. 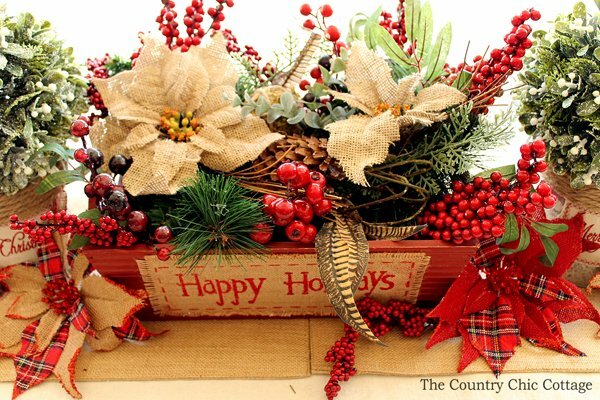 And you know I love those plaid poinsettias! Very cute! I’ve heard of At Home but haven’t shopped there. I will have to take a look at what they have. Your post inspires me to add some plaid to this year’s Christmas decor. NO “at home” stores in our neck of woods unless in Denver. Not even going there after i saw news tonight. I70 was shut down in few places, having blizzard, accidents everywhere. Unless i want to die not going over those mountains. Love your centerpiece, got couple ideas for my own. Have some trugs out on deck so will paint one to make centerpiece with for half wall between kitchen/living room. bought some picks at Michaels and some stuff at $tree, will be decorating for holidays with that stuff and what I’ve made this year. Not getting holiday decorating boxes out at all. Too much mess and confusion all over house after holidays. Not going to be up to it this year. Having right shoulder replaced on Dec. 7th. so have to rely on hubs to do any decorating and he’s not exactly mr. cooperative. You always have your home so pretty and homey, warm and welcoming, love it. Your decorations are awesome Angie, can hardly wait to see your home for holidays. Are your kids getting excited about holidays and writing their letters to Santa? Such fun with small children. I envy you. 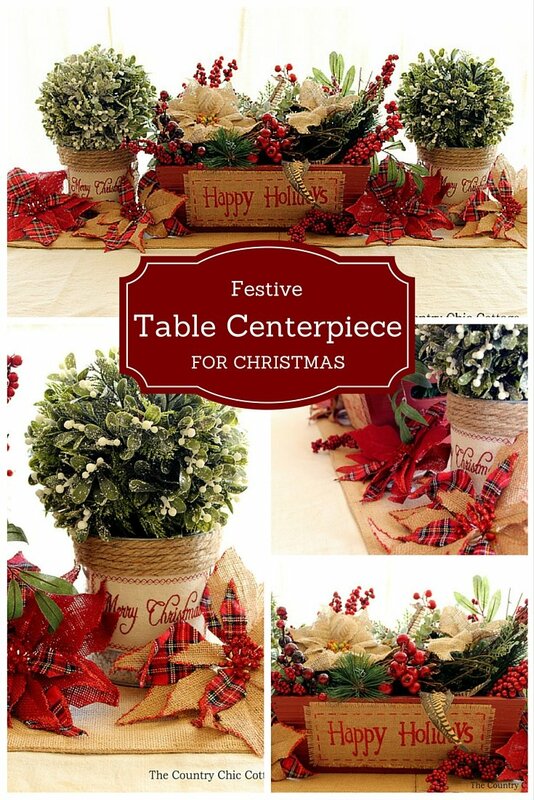 Your wonderful centerpieces are great start for your holiday decorations, need to go back to see post you referred to. i used to do holiday decorating when I was kid in our house, my Mother worked 6 days a week and cooked/baked, did laundry on her only day off. In those days there weren’t washing machines like now, was one of those wringer washers and hanging out to dry. Good thing Tucson had good weather most of time. My Dad would advise me as I made things and decorated. Think any arty I got was from my Dad, he was really good oil painter. I did see the weather report for Denver! Amaazing! Glad you got some ideas anyway! Best of luck on the surgery! My youngest is 10 so I hope he will write a letter to Santa! He is borderline on believing and not!! How pretty! I love all of them! Thanks for sharing, visitng form Weekly Create & Share LInk Party.